UPDATE: Since the last update, the car has been repainted in a custom 2 tone Ford Tungsten Grey and Audi Phantom Black Pearl with a red pin stripe. 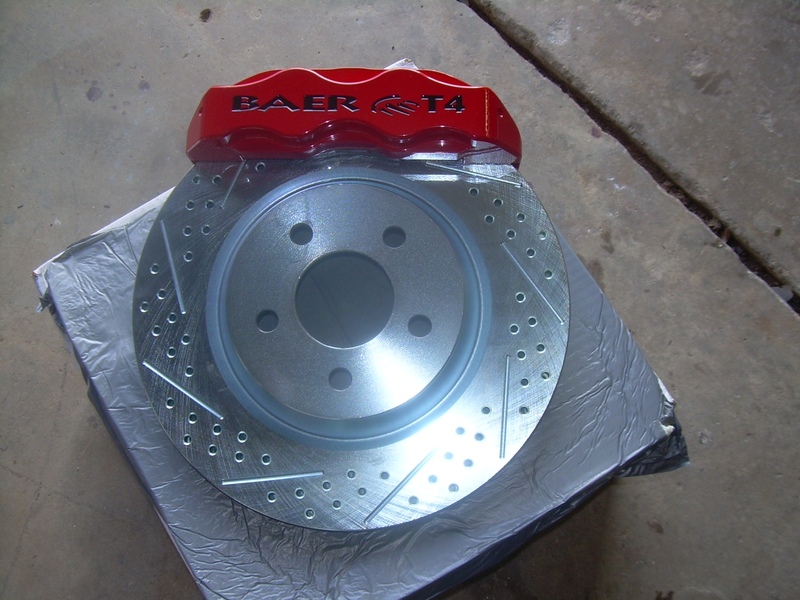 Baer 4 piston caliper brakes and global west progressive rate coil springs up front with kyb shocks and we have a new Heidt’s 4 link rear with coilover shocks going into it very soon. 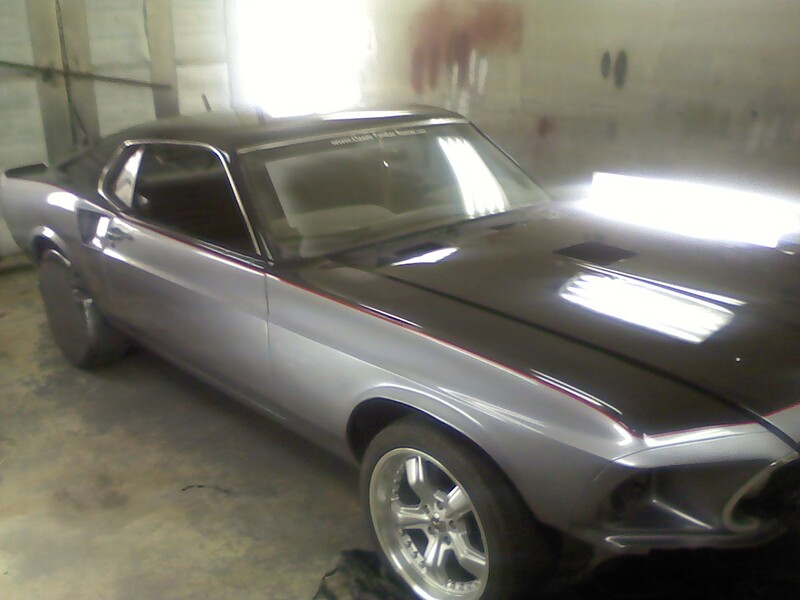 ORIGINAL RESTORATION: We started with a 1969 Mustang Fastback that had been sitting dormant since 1994. The car remarkably was in very solid shape for sitting under a tree outside for 15 years. After a brainstorm session with a pad of paper at our local favorite wing restaurant we had a game plan. We started by removing the tired driveline. The only thing remaining of the engine we used was the block and crank. Aluminum Patriot heads, forged rods, Keith Black pistons, Weiand aluminum intake, 650 cfm Holley carb, Milodon oil pan, equal length headers, 2.5″ dual Flowmaster Super 44 exhaust with H crossover. Engine is bolted to a C4 race built automatic trans with Boss Hogg 2800 stall converter. My dad, Mike, bought this car in 1987 or 1988. 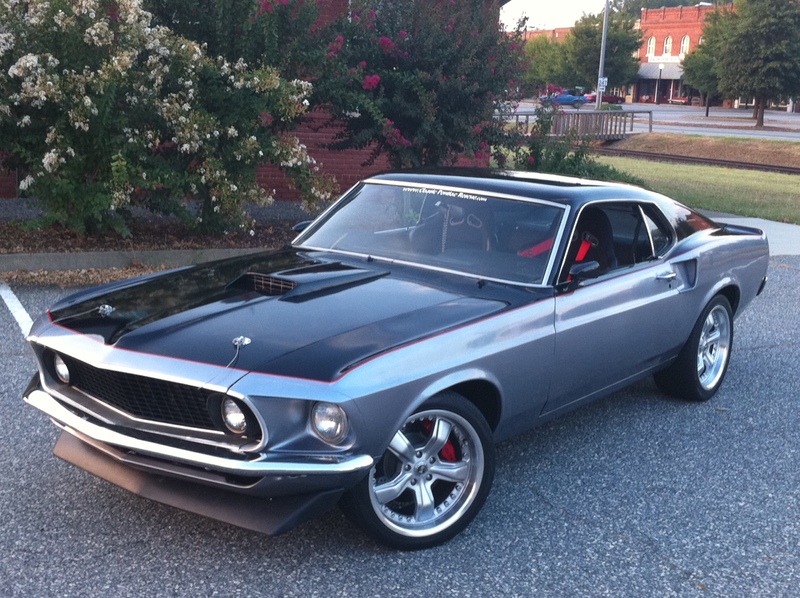 It was pretty much a stock rebuild except the previous owner had installed Mach 1 interior. Good looking daily driver, nothing more. It was a tired 302, stock internals and suspension, 14-inch wheels on old school radials. Not exactly a corner carver. My parents split up when I was 16 and since my mom worked swing shifts, my dad gave me this car so I could drive myself to school and work. Since I was 16, of course I dogged it, even though he told me not to. Then one day in the school parking lot, I backed it into another car and tore up the tail panel, trunk lid, wing and rear pass quarter panel. I thought I was gonna die, I felt so bad. Dad didn’t freak out like I thought he would though, thank God. If I were him I would have killed me (Ha Ha). We had it fixed and repainted, and it looked better than ever. After a couple more years of me driving it hard everywhere from Atlanta to Myrtle Beach, my dad had picked up a white ’87 5.0 and he let me drive it now and then. Then he found a black ’89 5.0 with about 9,000 orig miles on it, really clean car. He jumped on it, and we agreed it would be better if i take the ’87 and we park the ’69 so we stop putting so many miles on it. This was in 1994. Fast forward a decade or so, and we fell into the old “we’ll fix it up one day” syndrome. We started talking about how much money it was gonna take to fix it up, versus how much we could get for it and just buy another one already fixed up, but we never quite could bring ourselves to do it. Then on January 16th, 2002, my father was in a head-on motorcycle accident, and unfortunately, passed away the next day. It was the worst day of my life. My dad and I were always close, more like friends almost. 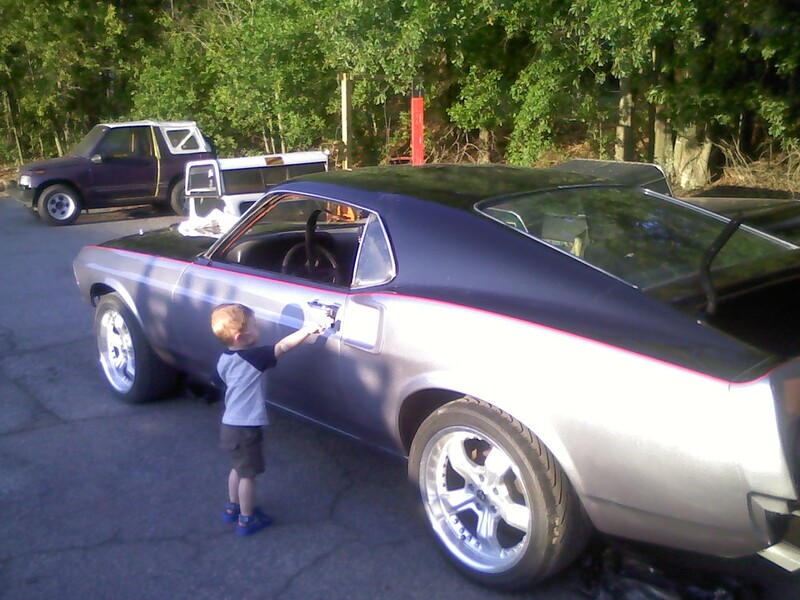 He gave me his love of old cars, especially Mustangs. Over the next 5 or 6 years I wanted to fix the car up, but I never really had the kind of money I knew it was gonna take to do it right, or who I would even get to do the work. This is upstate South Carolina, not exactly a hotbed of speed shops. Then, through some mutual friends, I met Joe Jackson. While getting to know Joe, i could tell he had a passion for old Detroit iron as much as I did. We started talking about the possibility of Joe and his company, Classic Pontiac Rescue, restoring the ‘stang. This was the first person I’d talked to about doing the job that really “got it”. He knew how much it meant to me, and that it wasn’t just a car. So we jumped in. Its been a long road, but its been worth every minute. The Mustang is back on the road, and better than ever. I never imagined how far we were going to go, but like Joe kept telling me, “we’ve gone this far, we might as well go ahead and do this…” LOL. This thing is pure evil, and I love it! I scare kids in Hondas every time I leave my house. Between the time we started this project and the completion, my wife, Rebecca, and I had our first child. Dean Michael Scott Weldon may have never gotten to meet his grandfather, but one day he will have the car my dad bought for me, and a part of him will live on. Thanks to Joe and Wes at C.P.R. for all their hard work. It means a lot.